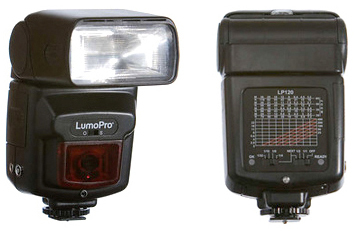 Dutch photography shop Camera Tools, the European distributor of LumoPro products, has announced a new and improved flashgun, the LP160, to replace the original made-for-Strobists LumoPro LP120. Dutch photography shop Camera Tools, the European distributor of LumoPro products, has announced a new and improved flashgun, the LP160, to replace the original made-for-Strobists LumoPro LP120. Read the full news post here (in Dutch). Swivelling and tilting flash head, including 7° downwards tilt so you can point the flash more directly into the centre of an umbrella. Can be triggered by hotshoe, PC jack or 3.5mm port. The LP160 was on show at the 2010 Professional Imaging convention in Nieuwegein and will be available in late March.